Sometimes I look at past decisions I’ve made and I just want to shake my younger self and shout, “Listen! Listen! For Pete’s sake, Listen!” because what I used to do all the time (& still catch myself doing on occasion) is charge ahead (think bull in a china shop) when I should have been stopping to check my gut & my intuition. Every (& I do mean every) major mistake in my life (ones that caused me lots of suffering) came from me not listening when that still small voice inside me said: Don’t do this. This is a bad idea. Every missed opportunity came from me not listening when that same voice inside me said: Say yes, even if you’re scared, do that. I’ve come to learn that a lot of people don’t trust themselves a whole lot. Maybe it’s the way they were raised. Maybe it’s from a lot of past mistakes making them gun-shy when it comes to making decisions. Maybe it’s from a harsh/nasty personal attack coming from someone else. Maybe you’ve spent a lifetime basing your choices on what other people want or their fears for your life. So what ends up happening is you learn to refuse to listen to your own self. Whatever caused it doesn’t really matter. What matters is believing all the answers are already inside yourself. Your internal GPS is working, I promise. You just have to trust yourself and believe that voice inside telling you what to do really does know what’s best for you and what you really want. Really, it does. Sometimes it’s hard to listen to your own self when other people are wheedling, cajoling, guilting, threatening, pleading, whining, and the like. You might panic and second-guess yourself. Other times it’s just plain scary because that little voice knocks you clear out of your comfort zone (& honestly, how many people relish the idea of that?). So you may let fear rule until it drowns out everything else. Or maybe you let your head talk you into or out of (making excuses, justifying) what that voice is saying because you just don’t want to listen for whatever reason. But I promise you that small voice inside you knows things that you might not even be willing to admit to yourself. It won’t steer you wrong. Slow down. Take a deep breath. Then take another. Calm down & get quiet. Honestly, I’ve learned (sigh, through much not listening) that it’s all about taking the path of least internal resistance. If whatever choice you’re facing makes you uneasy mentally or physically (for instance: you feel panicked, sweaty, nauseated, tense, like you just need to get the heck out of there, etc. ), pay attention to that and decide accordingly (& yes, you are allowed to say no). Like anything you practice, the more you listen to your internal guidance, the easier it will be to keep doing it until eventually it just becomes second-nature & you don’t even have to think about it. Your life will flow a lot easier when you learn to pay attention to your body cues and to that still small voice/nudge in your gut/whatever you want to call it & you do what it says every single time. Mine has, I can tell you that. 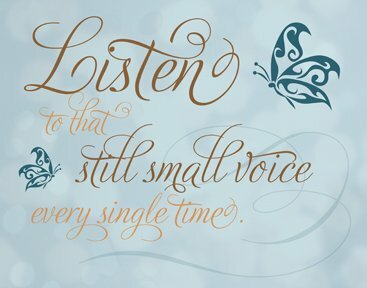 6 Responses to "How To Listen To Your Still Small Voice"
Hello there, Shelli. Great advice. Thanks for sharing. I’m going to let this percolate for a while, treating it as something I needed to hear. Not sure why just yet, but perhaps it’ll come to me… I wonder whether I have been so busy charging ahead like that proverbial bull that I have caused myself needless trouble, too. Thanks for the fab compliment, my friend. Always lovely to hear from you. You know, sometimes I get advice like that too. Strikes a chord but I don’t really know how it applies to my life & then later it will hit me. Hope it hits you gently. 🙂 I am excellent, thanks. On schedule with my novel so I’m very happy about that. Best wishes for a successful book tour! I hope the tour’s going well for you. And always, I look forward to seeing more of you. You have a great weekend, too. Cheers! Thanks for sharing this concise set of recommendations that can help keep many of us out of trouble in the future! Awww, you are so fabulous! Thanks for the compliments & encouragement. I really hope people will listen. I really hope I will listen (because *sigh* sometimes I still don’t … but I’m working on it). 😀 Have a great rest of the week, my friend. Cheers! Great to see you here! I am so glad this post found you at a time that you could use it. Sending good thoughts your way for the changes you’re making. The Life List has been the best thing I’ve ever done for myself. I hope you’ll make one. Cheers, darlin, & have a great weekend!